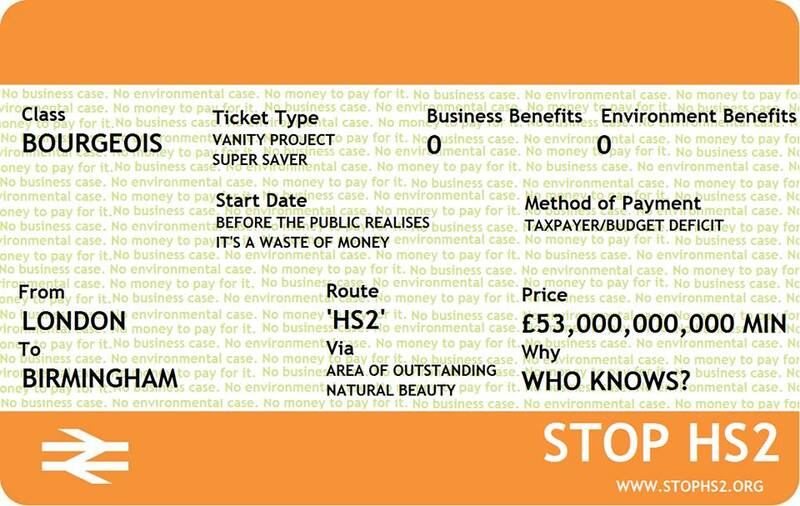 STOP HS2 | MPs sign motion to block HS2 Blank Cheque Bill. With several MPs who have expressed long-standing opposition to the project having not yet signed, it is expected that the rebellion against the party whips will increase when the vote happens. Government ministers affected by the route such as Jeremy Wright and David Liddington have conveniently found other things to be doing, so as to avoid having to take part in a vote which would demonstrate if they value their constituents their or careers the most. Green: Caroline Lucas (Brighton Pavilion). Plaid Cymru: Hywel Williams (Arfon). Labour: Frank Dobson (Holborn and St Pancras), Natascha Engel (North East Derbyshire), Geoffrey Robinson (Coventry North West) and Jim Cunningham (Coventry South). Conservative: Cheryl Gillan (Chesham and Amersham), Andrew Bridgen (North West Leicestershire), Dan Byles (North Warwickshire), Peter Bone (Wellingborough), Nadine Dorries (Mid Bedfordshire), David T. C. Davies (Monmouth), James Clappison (Hertsmere), Julian Lewis (New Forest East), Ian Liddell-Grainger (Bridgwater and West Somerset), Charles Walker (Broxbourne), John Baron (Basildon and Billericay), Edward Leigh (Gainsborough), Andrew Turner (Isle of Wight), Stewart Jackson (Peterborough), Bill Cash (Stone), James Gray (North Wiltshire), Jeremy Lefroy (Stafford), Fiona Bruce (Congleton), Steve Baker (Wycombe), David Ruffley (Bury St Edmunds), Tim Loughton (East Worthing and Shoreham), Christopher Chope (Christchurch), Andrew Rosindell (Romford), Bernard Jenkin (Harwich and North Essex), Philip Davies (Shipley), Anne McIntosh (Thirsk and Malton), David Amess (Southend West) and Sarah Wollaston (Totnes). Who are the failed to vote MPs please. I believe that the cost will be more like 100 billion by the time they have compensated those home owners in the south.Now that they are owning up to the rising costs perhaps the M.P.s facing cuts to their departments will sit up and take notice where their money is to be spent. Looks like you lost the argument? Let’s be honest – you’re fighting a losing battle? Interesting there are a number of MPs on this list whose constituencies are not on or near the route. I’m pleased they have seen through the government’s smoke and mirrors. Pity that Messrs Wright, Liddington and Fabricant couldn’t add their names to the list. The compensation argument doesn’t wash because we are some considerable time away from even having a proper scheme in place to pay compensation. Challenge to Mr Cameron to remove the whip on parliamentary votes on HS2. If it is such a good idea he has nothing to fear does he ? If he doesn’t remove the whip then surely the de-facto decision to proceed with HS2 is the government’s not parliament’s. Hope the judge can see that. Jeremy Write said he would have voted for if he had been there.I feel that for some reason he and others believe it will be money used for compensation.There would be no need for compensation if itr didnt go ahead and the money used for better things.